First released in 2010, Ford has created an unstoppable monster of a truck. Originally inspired by Ford’s performance heritage in off-road racing, which includes Best in the Desert, Lucas Oil Off Road Racing Series, and the famous Baja 1000, the F-150 Raptor is, hands down, the most powerful off-road pickup on the market, and everything we’ve learned about the 2017 model shows that Ford has no intention of surrendering that crown. The new 2017 Ford Raptor is the second generation of the off-road-ready pickup, and it comes with a host of segment-exclusive technology to ensure that the Ford Raptor is the most capable off-road truck on the market. The truck, which will be produced in the Dearborn Truck Plant and is set to go on sale in the fall of 2016, has been called the toughest F-150 model ever. With the all-new 3.5L EcoBoost engine, frame, and transmission, the 2017 Raptor is the most powerful too. There have been quite a few changes year over year that have made the Ford Raptor even more incredible than the heavyweight bruiser. For one, the truck is completely new for this year and will only be available as a SuperCab or SuperCrew body style. 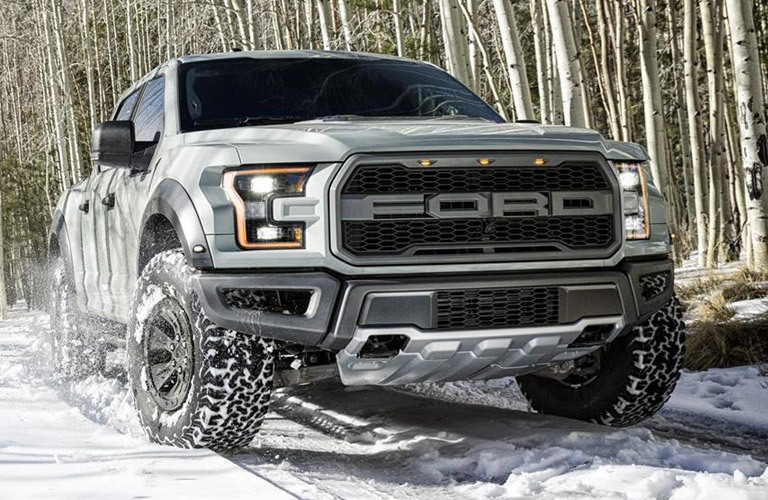 Weighing nearly 500 pounds lighter than before, the Ford Raptor was treated to the same high-strength, boxed steel frame that the standard F-150 received in 2015. The standard F-150 lost a full 700lbs, but the difference there is the strengthening for the Raptor, which actually made the truck even more durable off road. With better-running clearance than the first generation, greater power distribution between the front and rear wheels, and an all-new, four wheel drive, ‘torque on demand,’ transfer case ensures that the Ford Raptor is more than capable of handling anything thrown at it in the wild. The truck is a combination of all of the best attributes found in a clutch driven, on-demand, all wheel drive with durable, mechanical locking, four wheel drive. The 2017 Raptor even sports a set of 3.0 inch FOX Racing Shox, with custom internal bypass technology allowing for variable damping rates based on wheel travel. All in all, it means that this monster truck provides a great off-road experience with a smooth ride on road. Don’t let the aesthetics fool you though. A new frame and higher ground clearance aren’t the only upgrades this truck received. The new intercooled DOHC 24-valve high output 3.5L twin-turbo EcoBoost engine, with direct fuel injection, provides the Raptor with even more power than the previous generations 6.2L V8 (oh, and it’s also 4lbs lighter than the previous year too!). 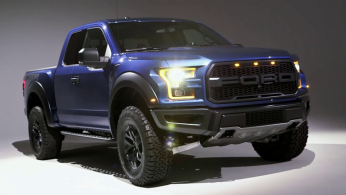 Combine this with a 10-speed automatic transmission, ready with paddle-shifters for manual-shifting, means that an incredible amount of power is sent to all four wheels, allowing the Raptor to deliver over 400 horsepower and 434 lbs-ft of torque. An important note here is that only the 3.5L V6 EcoBoost F-150s will be receiving the 10-speed transmission, which was co-developed as part of an agreement with General Motors. All other engine options, such as the smaller 2.7 L or the V8 will be offered with different gearboxes. While the transmission was developed as a team, each company will be calibrating the unit for their own vehicles and building it in separate factories, which is why you’ll soon see it on the 2017 Chevy Camaro ZL1. The power upgrades and steel reinforcement aren’t the only upgrades that make the 2017 Ford Raptor far more capable offroad than previous years. For one, the truck now has the benefits of the upgraded, six-mode ‘Terrain Management System.’ With six programs, the system is designed to handle pretty much any driving conditions, and each setting is easily selectable with a simple electronic dial. While it may be obvious, we feel as though it’s worth pointing out that this truck is purpose built for having fun off road. It does not have quite the same class leading towing capacity found in the standard F-150, and will probably require a lighter payload than some of its competitors, but that’s the thing about the Ford Raptor. This truck isn’t a work truck. This truck is for having fun, and trust us, you’re going to have fun. With the truck’s class exclusive beadlock-capable wheels to give you unparalleled performance on and off road, as well as the new BF Goodrich All terrain KO2 tires that have been specifically designed for the Ford Raptor, you’ll find that it’s hard not to have fun behind the wheel of this beast. The Ford Raptor was designed to make sure that you’ll be kept in comfort, despite the road conditions. The Terrain Management System and massive BF Goodrich All Terrain tires cushion the outside world while the updated interior keeps you protected, warm, and comfortable. Featuring three different color material levels, as well as exposed stitching on the deeply bolstered seats, dashboard, and door panels, the 2017 Raptor received the benefits of a fully updated interior, complete with trim-simulated carbon fiber and a thick-rimmed steering wheel with leather and simulated suede trim. Behind the padded steering wheel is a configurable digital information screen stuck right in between the gauges and designed to provide you with all the information you could need. The Raptor has been well endowed with all manner of technology. The new Sync 3 touch-screen infotainment system allows drivers to fully sync their phones to the car and wirelessly play music or other apps through the new premium sound system. Also featuring a push button start, 110V/400W power outlet, and auxiliary switchgear located on the cab’s roof for aftermarket equipment like lights or an air compressor, the Raptor is prepared for whatever you may need. The Raptor also comes well equipped for safety with its included comprehensive camera system that Ford has designed for the F-150. This complicated camera system is designed to improve front and rear visibility, and when paired with Ford’s Blind Spot information system, it makes it easier to stay aware of your surroundings than ever before. 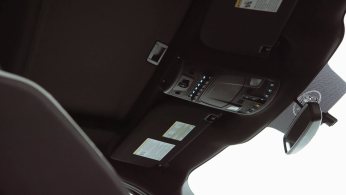 The Raptor will also be equipped with Ford’s 911 Assist® system, which uses a paired smartphone to call emergency rescuers following airbag deployment. Oh, did we mention the new military-grade, purpose-built steel frame that serves as the backbone for the Ford Raptor? With all of this you should be able to rest assured that the Raptor will keep you safe, even in the most dangerous of accidents. Since the launch of the Raptor there have been significant attempts to dethrone it as the greatest stock offroading truck on the market. Like the name scheme, the competitors have come close but have failed to recreate the awe-inspiring power and style that the Raptor represents. Both Nissan and Chevy have attempted to make their own Baja-runner, but only the Raptor has been truly built to excel at the task. 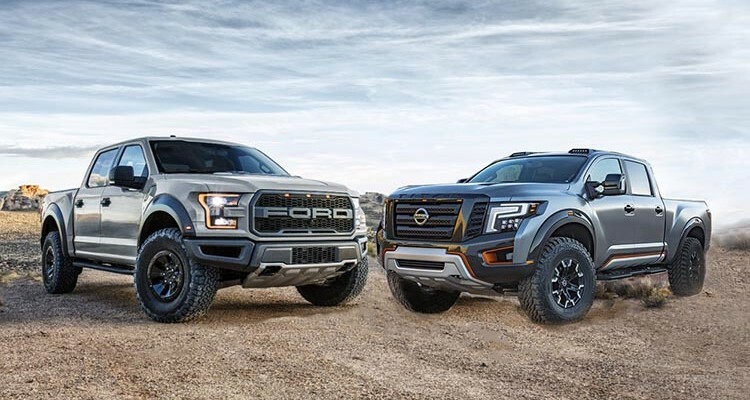 While they have not been able to recreate everything about the Raptor that has made it such a success, each the Nissan Titan Warrior and Chevy Reaper have taken heavy design cues from the Raptor and have succeeded in making their own muscled versions of the king. Admittedly, the competitors have outfitted their trucks in some top of the line, and very similar technology, but the Raptor is the only that comes with a comprehensive camera set up, a fuel efficient EcoBoost engine, and an unparalleled Terrain Management System. 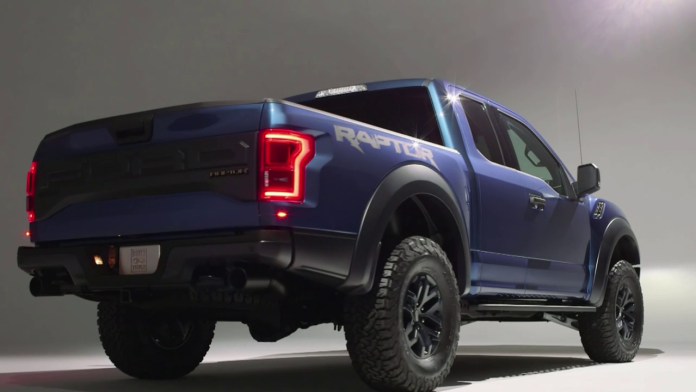 In fact, the Raptor remains the most off-road ready, despite having increasingly tough competition. Are you interested in the second generation of this beast? Sales of the 2017 Ford F-150 Raptor are expected to begin in the fall of 2016. While there hasn’t been a price announced yet, expect the truck to have a starting price of around $46,000 when it arrives in the fall. So far, the only available body styles are the SuperCab and SuperCrew, with three choices of engine styles. So what are you waiting for? Let’s start talking about the newest Ford Raptor today! Contact us to see if the 2017 Ford Raptor is the truck for you.